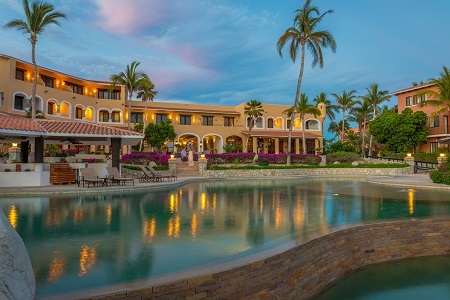 Casa del Mar Golf Resort & Spa overlooking the Sea of Cortes in Los Cabos, Mexico! Buy Per Room Per Night & Choose Your Length of Stay! Casa del Mar offers three gourmet á la carte restaurants, as well as 24-hour in-room dining options. 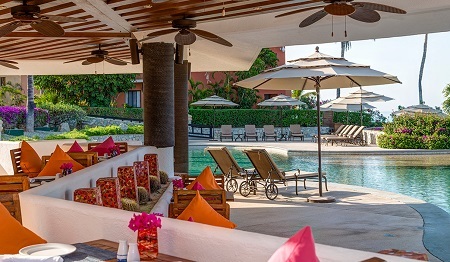 Explore the fusion of traditional Mexican flavors and Nouvelle cuisine; savor grilled specialties in romantic poolside settings; or enjoy ocean-front dining down at the Beach Club restaurant serving. For those looking to eat healthy, each menu features a selection of organic menu options to choose from and incorporates ingredients from our organic vegetable and herb garden. 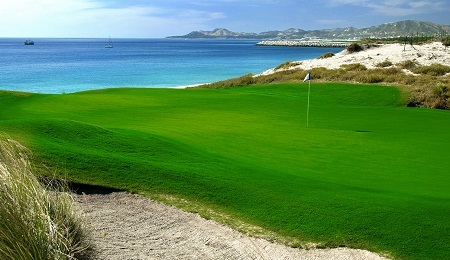 Home of three championship golf courses designed by several legendary golf architects, Questro Golf has been the golf outing leaders of Los Cabos for over 20 years. Enjoy spectacular views of the Sea of Cortez and let our team of professionals take care of you; every element of our hospitality contributes to giving you a smooth and relaxing experience. Offer is based on a Single or Double Occupancy in a Junior Suite Ocean View King for 2 Guests. The Junior Suites Ocean View feature private ocean view furnished terrace, most suites offer bathtubs and separate rain showers. 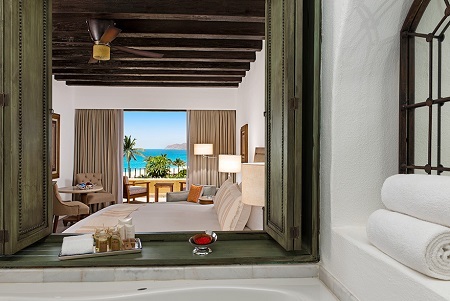 These rooms feature period pieces of Antigua furniture from fine craftsman, Mexican artwork and one king-sized bed. These suites are located in the main Hacienda and Aquario buildings. Stay a minimum of 1 nights or up to 14 nights as desired and based on availability.